And he’s right. Almost everyone knows it well. Preachers like to preach on it or at least to reference it occasionally. But I’ve noticed that many preachers misinterpret an aspect of the parable whenever they preach it. When it is preached, some ministers –– especially Reformed preachers –– like to read too much into the distinction between the older brother and the younger brother. Contrasting the older brother’s response with the father’s response is part of what Jesus is wanting to do in the story. No doubt he also wants to contrast the reconciled and humbled younger brother with the proud and arrogant older brother. But some people talk about the younger brother as if he is humble and therefore the model for a child of God. And they’ll say that the older brother, because he was out of the celebration, is shown not to be loved or accepted by the Father. In other words, people who resemble the older brother are not Christians. The true Christians are the younger brother types. “In Act 2, however, the focus is on the elder brother. He is fastidiously obedient to his father and, therefore, by analogy, to the commands of God. He is completely under control and quite self -disciplined. So we have two sons, one “bad” by conventional standards and one “good,” yet both are alienated from the father. The father has to go out and invite each of them to come into the feast of his love. So there is not just one lost son in this parable— there are two. But Act 2 comes to an unthinkable conclusion. Jesus the storyteller deliberately leaves the elder brother in his alienated state. The bad son enters the father’s feast but the good son will not. The lover of prostitutes is saved, but the man of moral rectitude is still lost. We can almost hear the Pharisees gasp as the story ends . It was the complete reversal of everything they had ever been taught. But the older brother isn’t an example of an unconverted person who doesn’t understand the grace of God. That’s not the point the parable makes. Yes, the older brother is left out of the celebration for the younger brother. And, yes, Jesus wants to show the Pharisees that the way they relate to the sinners and outcasts is out of line with the very nature of God. But Jesus has the father affirm that the older brother is still with the father and still has “everything” the father has. This is important for two reasons: first, it is always an important matter to come to a clearer understanding of the Word of God; second, the parable shows that God’s grace –– imaged in the actions of the father –– embraces both the returning sinner and the proud religious person. 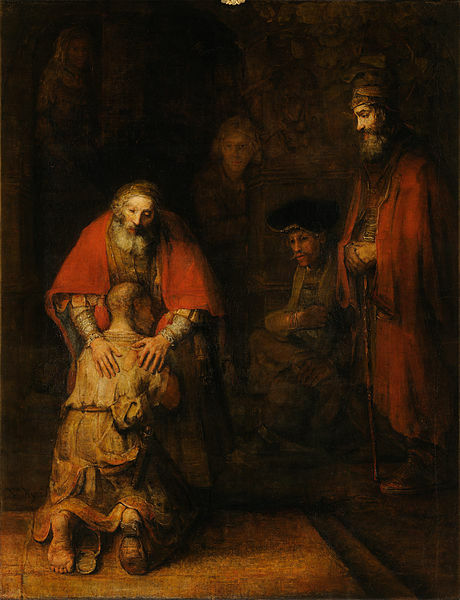 But the Parable of the Prodigal Son shows God’s grace for the broken sinner and the proud religious person. Let’s not lose sight of that in our desire to preach against legalism. But the younger brother had been restored to fellowship. He was loved and treated as a member of the household again – not as a hired hand or a slave. This restoration to fellowship was cause for celebration – not because the younger son was “good” but because of the Father’s great love for the younger son. The older brother seems to have felt unappreciated because the father had never celebrated his faithfulness with even a less expensive animal, yet here he was extravagantly celebrating the return of his lost prodigal son. But celebrating the return of the lost brother to fellowship is not the same thing as devaluing the older brother who has remained in fellowship. God still loved the son who had remained in fellowship very much. God still had great rewards awaiting this son. The woman who found her lost coin did not devalue the other 9 coins by celebrating the finding of the lost coin. Neither did the happiness of the shepherd who found the lost sheep devalue the other 99 who had not been lost. It is only good and right to celebrate whenever a person is rescued from death unto life. Mark Wendt – Thank you for pointing out the other two parables told along with this one. I have always heard it preached like the older son was practically without redemption, “trusting in his own works”, but I don’t believe that is how the father addresses him. I think the point is simply that the return of a lost one is worth celebrating. They are not “better” than the ones that stayed faithful, but they are still accepted upon repentance. THAT is the part the Pharisees could not grasp. One day, this passage encouraged me to ASK my Father for blessing. He WANTS to give them to me, whether I’m repenting from sin, or whether I’m doing fairly well today (and let’s face it, who’s really doing well?) . here’s another question: Why is it so often assumed that the older son did not go in to the celebration after his talk with his father? We are NOT TOLD his response. The point is, EVERYONE has to make choices to be in agreement with the Father’s heart. Ashan – it’s NOT better to disobey. But is IS better to repent AFTER disobeying that to NEVER admit you have a problem. Who would accept God’s gift of forgiveness for his sin if he never acknowledges he is guilty of sin in the first place? Sin requires judgment and we must address that. Physically, the older son in this story will still inherit all that is the Father’s; the younger son is just allowed to live there. So his lot in life is “better”, as long as he is in agreement with the father.